British crystal malts give this beer its distinctly deep amber body and nutty aroma that persist throughout the glass. The soft underlying hop bitterness is tempered with the flowery aroma of the U.K. Golding hop. Like its namesake, Bulldog Amber Ale is tough on the exterior with a soft disposition, so it’s a great introduction to Half Pints. A- This one is interesting...I poured two glasses, to share with my wife. Mine poured a very hazy golden amber colour, but the other glass poured crystal clear?! I'm guessing that it's b/c I poured mine quite hard and the other was a soft pour. Anyways, both provided a quick foamy head that turned into a moderately thick ring around the hazy beer and a thin one in the soft pour. Doesn't have much carbonation upon inspection. The color is very good on this beer! S- Dominant malt, but also some nuttiness, yeast/fresh bread and toffee tones can be detected. I enjoyed the sweet aromas that reminded me of brown sugar melting on oatmeal. T- Great flavor! I really appreciate the rich malts, but was surprised with the hops that come out during the finish....considering this promotes itself as having only 20 IBU, it's definately noticeable, but not unwelcome! This has flavours that remind me a bit of milk chocolate (more in the finish), but sweet dough and/or unsalted nuts as well. M- Nice buttery texture best describes this, but there seems to be some viscosity to it, as it seems to leave a slight coating in the mouth. There is a mild/moderate carbonation, but the bubbles are small and just add a small zing to the palate. It really does have a relatively full body and is well rounded! D- Even though I find this quite filling...I think I'd have a couple of 660mL bottles before calling it quits with this one for a night. The flavor is so amazing and it is a very distinctive beer ,which I feel will bring many different likenesses in a short time. This was a real treat....too bad this isn't available in Alberta and I only brought 1 bottle back with me. Great job! Puts a murky amber orange ale in the glass with a massive rocky white head that reduces to a 1 finger tight cap which lasts and laces, Soft carbonation and unfilterd. Aroma is very pleasant cookie dough with toffee and some grassy mustiness. Wonderful crystal malt toffee tones in front are quickly met with wonderful apricot fruitiness and a herbal hoppiness, soft carbonate mouth feel, finishes wet and lightly fruity-sweet with the dry hop golding "tang" balancing it. Great flavorful quencher. Well done Dave! Clear, orange/amber hue, decent swath of milky foam rests atop. Clean, malty aroma. Light fruit, not much else. Taste: light, clean, malty-dominated, slight hops, but they only mingle in the flavor, don't stay and associate with the taste or anything, for that matter. Caramel and nuts hold center stage, with a side of butter notes.There's a bright, but odd additional twang in there, that I can't finger. Hops linger lightly, malt shines, ...but I kept wanting more in the way of both. Very easy-drinking, very friendly ale...if too much so. Sorry, the odd element in the taste, a little plastic-y, and the lack of depth makes this a tad disappointing. Bottle courtesy of Piscator34: Poured a deep amber reddish color ale with a medium dirty white head with good retention. Aromas of citrus hops are well balance with nutty malt. Taste is refreshing with sweet nutty malt with a nice bitter finish. Body is above average and I appreciated the low filtering. Probably one of the best amber beers Ive had (not a style that is usually know to produce real gem though). Thick lasting fluffy head. Amber. stronger nose than most of Rudges Bushwakker beers. Noticeable hop presence. Flavour seems hoppy for only 20 IBUs. More like a Bitter than an Amber. Chewy malt presence grows on you. A very decent beer for a Bar-B-Q. ENjoyed at Bar Volo. Light amber,with a thin white covering head, and some lace follows. Aroma is not rich, there is some hops and it is neutral at best. Medium mouthfeel, smooth drinking. Medium bitterness yet only 20 IBU. Later sips produce more maltiness. A mild brown plus, a prototype Canadian beer. Well crafted owing to its good balance, absence of distracting carbonation. Zithal shared this one at the Biergotter group brewday 2007. Thanks Rob! This one poured a clear, dark gold colour with a fluffy, white cap. Decent head retention with a bit of lacing. Mild aroma with notes of herbal and lemony hops. Weak malt character with some fruity esters. Herbal bitterness appeared in the finish. Light bodied with moderate carbonation, decent texture. Not bad, but a pretty generic amber. 12 ounce botte- pours a cloudy, murky dark orange/brown with some soapy lacing. Nose- sweet crystal malts, some grain. Initial sip is dough, caramel, a little creamy. The finish is grainy with earlthy hop bitterness, and again the crystal malts. Moderate carbonation. Biergotter Club Brew marathon tasting. Zithal brought this one from far far away! Pours a clear amber, very thick white head forms, tons of lace, settles to a nice layer. Smell is grainy, some bread, caramel, nice floral/citrus hopping, very balanced. Taste is nice, grains, slight burnt flavour, caramel, floral, a bit metallic, nice balanced finish. Mouthfeel is light to medium bodied with medium carbonation, pretty drinkable stuff, not complex but doesn't need to be. Thanks Rob! 660ml bottle poured into a pint glass. Copper/amber coloured brew pours slightly hazy with a 1/2 inch head that subsides to a 1/8 inch and stays around. Medium carbonation. Smell is lightly floral with a healthy dose of citric hops. A light buttery and nutty toasted malt, almost like peanut brittle, rounds out the nose. Mellow and warm, a very comforting beer. Not overly bitter but a stringent acidity dries the palate balancing the light caramel roasted malt character. There's a sweetness but in no way is it overwhelming or cloying. There's a definite earthiness about this brew that keeps it well-rounded and unpretentious. Not blowing my head off, but the colour and flavour make me think of harvest-time and relaxing after a hard day's work. Balance is near-perfect. Mouthfeel is creamy but a bit thin, as I find a lot of British Ales to be, but it's a minor quibble with an extremely balanced and drinkable beer. Much thanks to a coworker for bringing me this bottle after he spent New Year's in Winnipeg. The beer is a very nice clear copper colour with a good sized off white head. The head falls to a thin cap and stays that way. Biscuity malt aroma, hay and nuts. Just a touch of musty yeast in the aroma even. Interesting, different from what I expected. Very malty to taste. Baked bread with honey spread on top. The hops are flowery, and the lingering finish is almost cracker like. Really has more of an English feel than American. Quite nice. Medium bodied with a lively dose of carbonation, this beer is a very smooth drinker. My first experience with Half Pints does not disappoint. Another solid, standard fare from Half Pints. Slightly cloudy orange-amber colour with a fairly sizable head that shrinks down considerably once you start drinking. Large swathes of foam stick to the sides of the glass. Rich, slightly sour malt smell with some good hop bitterness to it. Slightly nutty, caramel scent. Bready malt taste, not sweet and the hop bitterness is controlled. Very faint fruit hints: bananna and possibly some grape in there. Nice, low carbonation. This is very easy to drink andeven though it comes in a bomber, I could put away a few of these. Light amber in colour with medium carbonation. Aromas of hay, buttered biscuits, and very mild orange. Soft mouthfeel, with notes of fresh baked bread, honey, very mild nuts, and mild caramel. Solid bitterness. I was expecting this to be my least favorite offering from this brewery, but so far, I think I like it the best. Far less caramel/malt centred than its American counterparts. An excellent standard Amber. 341ml brown bottle with twist off cap. Part of a Taster 12-pack. Poured in a pint glass. Hazy, copper-amber. Off-white head is 1/4 inch on the pour, but quickly recedes to a thin ring around the edge. Aroma is malty and sweet. Caramel and malt with a hint of floral hops. Smooth and sweet. Caramel and malt backbone with a hint of floral hops. Wet finish lingers a long time before giving way to a slightly bitter floral hop aftertaste. Medium bodied with minimal carbonation. Smooth drinking beer. A little too sweet to drink more than a couple, but still a nice relaxing ale. thanks to trevorwideman for this bottle. Appearance: Pours a rusty copper colour with a big foamy white head. Very hazy and opaque. Aroma: Nice malts with a bit of a bready character. Also plenty of fruits and slight caramels. Taste: Beautiful. Lovely bitter finish with a touch of sweetness in the front pallette. Very earthy malt flavour. Mouthfeel: Smooth and creamy. Quite heavy, which adds to its beauty. The carbonation is perfect at a medium level. Final Statement: This is a real winner. Possibly the best amber ale i've had. It's malt flavour is very unique and salivating. Definately seek out this brew! Bulldog Amber looks like a sunset awash in rhubarb juice. It has a great orange-y-pink colour and striking, glossy complexion that is transparent although not altogether clear. Its head could be called soapy or sudsy but only for so long; after a certain point the only word to describe it would be 'non-existent'. Same goes for lacing. The grassy, floral qualities of U.K. Golding hops are pleasant, although I find pine resin and grapefruit ideal matches for nutty crystal malts. (Then again I enjoy peanut butter and roast beef sandwiches. These things are subjective.) However, what concerns me more than which variety of hops were used is the quantity - this is only mildly hoppy, at best. The fact that it's a bit under-hopped is easy to forgive considering that it's well malted. Lots of nutty-sweet crystal maltiness abounds and with it notes of toffee, pecan, praline and just a hint of rum-raisin. And it's not like the hops were entirely disregarded either. Traces of tree bark and flower petal can be appreciated, especially on the finish. Given all its nutty sweetness, the beer drinks quite smoothly with little bitterness to get in the way; 20 bittering units is a modest amount for any style but especially in an amber ale. A few more kettle hops might have amounted to a bit of spiciness, lending the beer the additional texture needed to earn a higher grade for mouthfeel. Half Pints' portfolio is up-and-down as solid as a brick house. Their amber ale demonstrated all the quality and craftsmanship I've come to expect from this brewery. There's nothing not to like here. Anyone comparing Bulldog to the highest rated ambers is failing to appreciate what is a well balanced, super agreeable and highly enjoyable ale. Served in 20oz pint glass. Pours a light copper, crystal clear, with little carbonation. Thin head forms and quickly recedes to a ring. Aroma is thick caramel, toast and nuts. Very good. Taste has a lot more hop flavour than I was expecting, but that isn't necessarily a bad thing. I would say it's even more hop than malt, and it is present from start to finish. The body is medium, and while the carbonation is quite low, it is still crisp and refreshing. An easy beer to drink. I could down several pints of these while out for the night, but at home I usually go for something a little more dynamic. 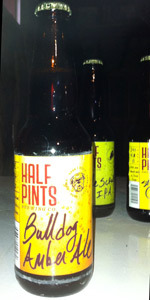 My first taste of Half Pints is a good one! I was really taken in by the malty aroma, so the hoppy flavour came as a surprise. A solid offering. Thanks to trevorwideman for sending me a 660 mL bomber to review! The beer poured from a 660 mL bomber bronze with a white, one-finger head that shrank slightly but had good staying power. The smell was mainly biscuity malt, accompanied by a slight nutty aroma and a bit of a sour yeast funk. Bready, biscuity malt and caramel were front and centre in the taste, though there was a bit of a darker malt flavour. Subtle floral hops rounded out the taste  barely there, but enough to notice. Nice lively carbonation and a slightly dry finish rounded things out. A pleasant, straightforward beer overall. An all around excellent amber ale. Found a lost notebook cleaning the car today that contained this review, must have done it at least a couple of months ago. Thanks to chonyr and raider for bringing this back from the 'peg when they went to the Grey Cup. Poured a clear, deep amber tinted with hues of bronze. Nice two finger offwhite head formed from the pour, and subsided to reveal intricate lacings ringing the pint glass. Comforting aromas of slightly toasted nutty bread, accentuated with the earthy, grassy and floral aromas of Goldings hops. A good dose of the Goldings lends a nice depth and complexity to this simple yet very tasty amber ale. Very nice mellow nutty flavour, macadamia? Bready and toasted malt character also quite evident. The earthy, floral and slightly grassy Goldings round out this tasty brew. A somewhat dry light to medium bodied ale. Decent dry malt backbone perfectly complimented the mellow, earthy and floral/grassy spiced Goldings. Incredibly drinkable and sessionable. An excellent choice for introducing a molbatt/BMC drinker to the incredible realm of craft brew, yet tasty and with enough depth of character to please the experienced, adventurous beer drinker. Very well rounded and suited for all seasons. Will definately drink this tasty treat again. Another top-notch ale from the mcro brwery from the 'Peg in the looks dept. 4 fingered head in the pils glass ( heathen) nice rentention and loads of sticky webs o' lacing. Colour is a true hybrid mix of amber and reddish brown. Slight haziness/cloudiness to it. Decently rich toasted grainy malt aroma. Hmm...two letdowns in 1 night. A fairly generic, bland attempt here. Weak toasted maalts follwed by a bland wateriness. Pattern repeats it's self until a faint bitterness that reminds me of the bottom part of a lettuce heart finishes things off. Light to medium in body...Carbonation is about right. Not their best effort...an attempt to fill out their beer stable perhaps? Poured from a bottle. No bottle date could be found. Copper color with a quickly settling head. Sticky lacing is left down the glass. Not getting much of an aroma. I get caramel and some grassy hops. Nice mild, clean flavor. Just enough caramel malt to give flavor but not too much to make it taste artificial. Very little hop character. Light body and nicely carbonated. A very approachable beer but also not very interesting. 12 oz bottle into a pint glass. Thanks go to Deuane for hooking me up with a 4-pack of these Half Pint brews from a recent trip. Pours a hazy coppery amber, with 2 fingers of frothy off-white head. Retains with a creamy 1/4 finger that fires up very nicely, leaving back lacing that hangs in heavy clumps on sides of the glass. The aroma is bread and caramel, with some light spice and a bit of a green citrus edge. There is really only a moderate assertiveness to this, taking a bit to really grab a foothold in the nose. The taste is initially a bit dead up front, before notes of toasted malts, caramel sweetness, and some citrus roll in. A touch of spicy hops punches up the back. This is popping about as much as the aroma did. Just OK. The mouthfeel is lighter-medium bodied, with a gentle and softer carbonation that rides on top of a much slicker and slippery feel. Very easy feeling and drinking. The mouthfeel was probably the saving grace of this, as the the flavors just didn't give up a whole lot for me. It all went down pretty easily though, so no harm, and no foul. Still pretty average though. Thanks to kjyost for this one. Had it with my supper, takeout chicken. Poured from a 341ml. bottle. Appearance: A big 3 fingers of head appears atop a ... well... amber body that kind of looks like dark honey. The foam lasts quite a while and leaves some decent lacing. Smell: Lots of malt, roasted maybe? A bit of hops also. Taste: Tastes like a red ale. More malt than hops though the hops leave their mark in the aftertaste. A nice overall caramel flavor minus the sweetness. Mouthfeel: Active carbonation with a smooth, restrained bitterness. Drinkability: I'd have it again. Drinks rather well. Overall: I really dug this red ale. Nothing mind blowing but makes an average style stand out.